Can Yoga and Meditation Help Relieve Stress? You’re late to pick up the kids. The gas tank in the car is almost on “E.” And you have no idea what to feed the family for dinner. Feeling a little stressed? Your initial reaction might be to stop and take a deep breath. But, have you ever wondered why breathing deeply makes you feel better? “Breathing can be used as the anchor to reset ourselves when the mind wanders,” said Aditi Nerurkar, MD, medical director of the Cheng-Tsui Integrated Health Center at Beth Israel Deaconess Medical Center. Over the years, evidence has proved that integrative medicine, like meditation, yoga, acupuncture and tai chi, in conjunction with conventional medical care, can provide health benefits like decreased stress, better sleep and even improvements in heart health, arthritis and Parkinson’s disease. The type of integrative medicine practiced at the Cheng-Tsui Integrated Health Center uses evidence-based recommendations from the National Institutes of Health (NIH) as its guide in determining which therapies are offered to patients. “We aim to provide only those therapies supported by science, offered by highly skilled providers with an expertise in caring for complex patients, and work in tandem with each patient’s team of physicians to develop a plan of care best suited to address the patient’s needs,” Nerurkar said. 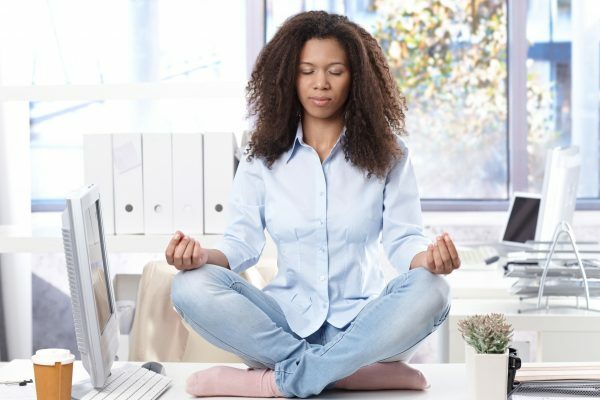 Using a variety of techniques, including postures and movement, breath awareness and breathing exercises, and relaxation and concentration, yoga can offer stress reduction, as well as other physical, emotional and social benefits. According to Sullivan, almost anyone can practice yoga. You don’t have to be able to bend a leg backwards, or even touch your toes. “Each person has his or her own starting place, and we work from there to improve flexibility and strength,” said Sullivan. The main type of acupuncture practiced at the center is from Traditional Chinese Medicine (TCM). It is a holistic approach to patient care in that, in addition to addressing the patient’s main health concern, it also addresses whole body wellness. Acupuncture uses hair-thin, sterile, disposable needles that are inserted at specific sites on the body to influence how the body functions. Traditional acupuncture is based on ancient Chinese theories of the flow of Qi (energy) and Xue (blood) through specific pathways throughout the body. Acupuncture allows the Qi to flow to areas where it is deficient or away from areas where it is in excess. This allows for the body to experience a harmonious balance of energy. Acupuncture can help with stress by harmonizing Qi, quieting the mind and easing muscle tension throughout the body. At the Cheng-Tsui Center, a thorough intake is done at the initial acupuncture visit to determine the patient’s TCM pattern. The acupuncture treatment will be based on the pattern, focusing on the patient’s main complaint, which can include stress, as well as other symptoms of discomfort. “Many patients find that acupuncture can help reduce symptoms that they weren’t aware could be treated, such as nausea and vomiting related to pregnancy, chemotherapy and post-surgery pain, when they had initially only come for stress,” said Cheng-Tsui acupuncturist, Lien Zayhowski, MBA, MAOM. Following the initial visit, patients can often see dramatic results, such as relief of their pain or other symptoms. In other people, relief tends to occur over a few days after treatment. Tai chi is a Chinese martial art that uses slow, soft, flowing movements, along with breathing and imagery, to relax and energize the body, mind, heart and spirit. It enhances and balances the flow of Qi, which can boost your daily energy levels, increase your sense of well-being, and help you ward off illness. At the Cheng-Tsui Integrated Health Center, the focus is on improving your quality of life by gently exercising the three pillars of tai chi: your body, breath and mind. Tai chi is also known to provide health benefits for many conditions, including balance and gait problems, sleep ailments, cardiovascular disease, neuromuscular disorders and more. Chang himself has been involved in a number of NIH-funded research studies exploring the benefits of tai chi for heart disease, Chronic Obstructive Pulmonary Disease (COPD), Parkinson’s disease and the elderly. Although they’re gaining popularity, integrative therapies were not often considered standard treatment options in the healthcare industry.